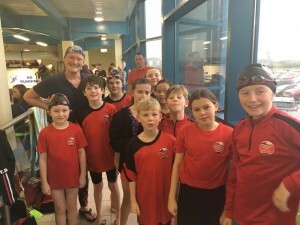 On Sunday 13th January, our swim team of Lucy Daly, Thien Doran, Yvonne Daly, Simone O’Sullivan, Conor Durkin, Cillian Meagher, Ruairai Daly, Alex McCarthy, Ciara Foley, Lucy Harrington and Amy Arthur competed in Tralee at a Munster meet 1 gala. It was a very successful day with fantastic swimming and plenty of PBS achieved. Well done to Lucy Daly on her gold and two silvers! She also moved up to Munster meet 2 level and achieved a meet 3 time as well!